I've been staring at a blank page for a very long time. It's almost become a daily ritual, my hands held in primed posture to express the concerns that weigh heavily upon my heart. Behind me is a proverbial pile of crumpled paper, all discarded efforts to put on paper something I could share with the people I one time preached to. Just how does someone adequately express something of this sensitive nature? And above all, to communicate in a manner that conveys love and humility when it so easily could be misinterpreted as bitter and arrogant? I've observed the controversies and passionate conversations concerning these issues for a long time, carefully noticing the fragile emotions of people while they dig their feet deeply into the soil of their steadfast opinions. It has been said that silence is the most difficult of arguments to refute. If I were to hold my silence, how could anyone contest me? So the truth is, I've considered abandoning my efforts to write anything at all. Far easier would the decision be to just gather my things, and vanish silently into obscurity, headed for where ever my future would lead. It would save me from this agony, and it would possibly preserve any trace of respect and reputation anyone may still have for me. It would leave room for reconciliation with people who are hoping I will still come to my "senses". But I am going to take a risk for the sake of my friends who know not what has happened, and for the sake of the broken, fearful soul who sits in confusion and knows 'something isn't right'. In March of 2013, after preaching the Message of the Hour for over 10 years and travelling to many churches and countries, I was willing to admit: I was wrong. 2 Why did I leave the message? 3 Where are we now? My name is James Rozak, and I am from Edmonton, Alberta, Canada. The Message has been around me my whole life. My parents left the Message when I was young due to confusion and hurt experienced during a major church split. However, with the influence of family and God's pull in my heart - I made a decision at 21 years old to commit myself to the faith of my childhood. The Message was all I knew and my extended family who were in the message were a picture of purity (and I still consider to be wonderful people who love God with all their hearts). When I surrendered, there was no holding me back. I gave myself in every way I could to love and service. 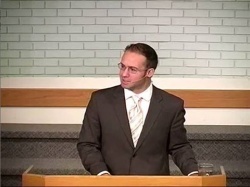 I have had the extreme privilege of preaching the Message of William Branham to some of the sweetest people on earth. I was unbelievably blessed to travel to many places in the world ministering the 'end-time truth', and along the way making friends with people from all corners of the earth. These friendships will forever be cherished and shrouded in wonderful memories. None were more precious than the people who I journeyed with for over 15 years in Edmonton. These people were more than friends; in many ways, they were my closer to me than my own family. The countless hours of fellowship and shared experiences cannot be measured in value. They were my best friends, my bacheloring roommates, my travel companions, my teammates, my playmates, my brother and sisters, my mentors and my spiritual parents. They were my groomsmen and my wife's bridesmaids. Their children were the closest of friends with my own children. There was such comfort and familiarity, which is so hard to compare or measure in worth. I miss them. These were some of the finest people I've ever known, and the fact I was given the trust to minister to them through the trials of life is beyond humbling. I considered my former pastor to be the best one I could have possibly served with. He was a man of unconventional ways - and I appreciated that beyond words. If there is a perception that people walk away from the Message bitter, hurt, angry towards their pastor, that isn't always the case. For my wife and I, we had every reason to stay. We loved our church and we were proud to be a part of such a wonderful group of people. This is what made it all the more difficult, when in March - we turned away from everything. The cost was enormous - and we knew it would be. I've heard it said that those who choose to walk away from this faith are merely choosing the easy road. If this is the easy road, then I struggle to think what the hard road would be like. It is harder than anything I have ever experienced in my lifetime. Over the last few months, our hearts have been broken a thousand times - day and night. Sometimes I feel that there's little left to break. Why did I leave the message? So the big question: Why? How did this happen? In early 2013, my wife and I faced an unexpected crisis. I had not shied from the challenging questions that had been escalating over the past couple years concerning the Message. Members of our own church were in the midst of the turmoil concerning Believe the Sign, and while many were oblivious (and still are) to the details of the issues, it was something I couldn't ignore. As questions came, I valued truth enough to not dismiss them without considering the answer. I did not publicly weigh the questions, realizing we would cause confusion and nervousness in the people around us. In fact, personally, I did not even share my studying of the issues with my own wife, as I did not want to unsettle her spirit. It wasn't until she began asking some questions on her own that our own dialogue opened to these issues. We ultimately counted that our faith and the clarity of the 'full revealed word' would surely stand the test. I had spent years defending and sharing the quotes and scriptures that Message Believers all held uncontestedly true. My wife was the sort of woman who prayed, listened and observed the Message teachings with vigour and well-regarded devotion. We were fully expecting that the answers we could not find would become clear in favour of the Message through sincere study or through the wisdom of seasoned message men of God. I always believe William Branham was a man capable of mistakes - it scared me to think there were some who would think otherwise. You HAD to concede that to believe the Message (in my opinion). Otherwise - we would all be believing some extremely odd things that science and common sense squarely disproved. In the end, while every phrase uttered by William Branham may not be perfect, I could always say that the God behind the message was. And so I could rest. Yet, over the course of the last two years, we had observed that few people were giving these questions any reasonable merit. As time went on, the most common response was an emotional reflex, based on little else than cliches and dismissive references to Dathan & Korah, Cain, Balaam, Judas, Foolish virgin, pharisees and the like. I silently studied and examined the claims. I remained certain that the Message, though imperfect, was the answer. Answers were possible - if one retained the wellspring of Message rhetoric available. I began to realize, that's what all the ministers were doing. Essentially, the argument became a showdown of 'facts' vs 'faith'. I confess things had been bothering me for some time. It wasn't that I had any premeditated plan of leaving the Message. I thought, in sincerity, I could be a catalyst of change in rediscovering the heart of the Gospel. Over the last months of 2012, I was passionately preaching what I felt was the "gospel"; that is, Jesus Christ alone. It was causing confusing in our congregation, and I could feel the tension building. I wasn't in any way attempting to disprove or disagree with the Message. But I did strongly feel something was very 'wrong'. My preaching was a genuine attempt to ensure people were actually finding Jesus Christ, rather than withering on the church pew in confusion of doctrine they couldn't really understand or legalistic works to prove their salvation. But I was causing more hurt than good and many and people were misunderstanding my motive. Why the anxiety about preaching from the Bible without a multitude of "Brother Branham said" quotes? It was when I began to realize how strong the tone of 'fear' was in the pews and pulpits that I stepped back and hit the 'pause' button. Streaming other services from message churches, I had to ask: Why the necessity for anger? Why the threatening tone? Why were other ministers passionately imploring the congregations to refrain from investigation and declaring any personal study via the 'internet' as a form of rebellion of headship? Why begin enforcing the view that it was only the 'five-fold' who were gifted to read and understand the Word of God? Why not just answer the questions? In February of 2013, I realized my ministry in the Message was completely finished. I couldn't, in good faith, preach knowing I was suddenly disagreeing with the Message whole (the teaching, the churches, the leadership). It couldn't be stopped. The more I looked at it - the more I could see that William Branham really did misrepresent himself and events in his life. It wasn't just a few isolated incidences and a few minor inconsistencies. If it were just that, we were more than understanding and willing to have grace for the humanity of William Branham, who we loved and respected. But it was story after story after story after story. The sheer volume of inconsistencies in events that supposedly happened in his life, when he was there to witness them. Why couldn't he remember his own upbringing? Why couldn't he recall events surround his first wife's death? Why did prophecies change constantly? Why did they appear to not even happen at all? Why was no one concerned about this? In the "pause", the lights went on for us. It was unexpected and we were really not prepared that we would suddenly find ourselves on the outside of Message, looking in. We realized in February we would likely need to leave our church - not knowing where we would go. We had still talked to no one about this, but we began making plans for a quiet, amicable exit - eventually sharing the news with our Pastor and family members. However, the situation in our church unfortunately combusted in a way we did not anticipate either as word of our leaving leaked out. In March, without a proper goodbye, we were gone. We were heartbroken and devastated. To this day, we miss our friends immensely. Personally, I left still believing that we would never leave the basic principles of the message. I made of list of the 'untouchable' teachings of William Branham. Yet, the very words of the prophet that seemed like the oracles of God continued crumbling in every conceivable way. We were left dumbfounded that we had not seen the issues before, but we could not deny what we were seeing. In the months that have followed our leaving the Message, we have gone through an enormous battle. Hours of reading, self-examination, study and prayer. If we thought we were sincere in seeking God before this happened in our lives, this redefined what it meant to 'seek'. Our study has completely cemented our opinion that William Branham was not who we thought he was. We feel his interpretation of scripture bears little resemblance to what Paul preached. Leaving has been the most profound, frightening and enlightening experience of our lives. I refuse to de-Christianize my friends in the Message. I believe I walked with many good Christian people. But I now believe that it is a stunning illusion that the "Message of the Hour" stands alone as the final voice to the final age. In fact, if it has accomplished anything, it would be that it's people have painted themselves into a small, lonely, exclusive corner that they esteem a sign of their spirituality. Are we scared for our salvation? NO. NO. And NO! We are more sure of it. Have we turned from our Bibles? NO. We have fallen in love with learning what it says and are continually AMAZED by it. Are there good churches out there? YES. Once the illusion of Message supremacy falls, you sudden realize how indoctrinated you have been towards a world of people who love God passionately. As the eyes of legalism and judgement crumble with the understanding of the gospel, you are left realizing how self-righteous and pious you've been. We've had to humble ourselves countless times in the last months and literally repent to God for our foolishness. I don't know who is out there reading these websites like Believe the Sign and Searching for Vindication. I know these website can be hard to read - and the attitudes can seem caustic when reading the debates. Your entire world view is being challenged, and for many of you, 30 or 40 years of 'belief' is at stake. But that doesn't dismiss the actual issues. My wife and I didn't wade into the waters of debate. You don't need to, nor do you need to adopt anyone else's attitude towards Brother Branham. But if you value your spiritual walk, I encourage you to TRY to answer the issues. YOU need to know for yourself. Don't accept a leader standing over you and telling you to close your eyes, close your ears, close your mind - and surrender yourself to his leadership, or to the words of a man who died 48 years ago. And if you find courage to jump into the waiting arms of Jesus Christ - don't be afraid. He's been waiting for You. We know. He didn't strike us down or banish us from His presence. He's been sweeter than we've ever known. I apologize to those who read this, and who are shocked or hurt. But if this is my final act as a man who was once regarded as a Minister of the Message of the Hour, then I share this with the hope that someone might be helped and learn the deepest riches of his mercy and grace. My name is James, I am a Christian, and I serve a living God. This page was last edited on 27 August 2015, at 03:26.